An Anchorage School District consultant on Monday unveiled two revised options for changing school start times based on community input. Under both options, no classes would start before 8 a.m., said Shannon Bingham, owner of the consulting firm hired by the district to examine the start-time issue. Bingham's presentation to the Anchorage School Board on Monday marked the latest step in the district's months-long study. 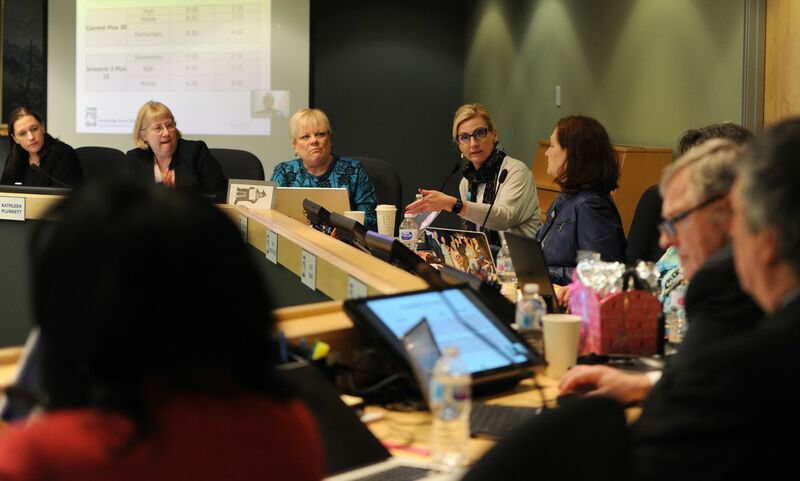 A decision is about a month away, said Anchorage Schools Superintendent Deena Bishop. The implementation of any change would begin in the 2019-20 school year. Bishop said an Anchorage-based research group will survey a sample of students' parents this month, asking them which of the two revised scheduling options they prefer. The research group will ask: Do parents want elementary, middle and high school students to start and end the school day 30 minutes later than they do now? Or, do they want to change those schedules even more — with middle and high schools starting 75 minutes later and elementary schools starting an hour earlier? The two options are not the ones the district originally asked the community to consider in April. Bingham said he crafted the revised scenarios based on community feedback received over the past month. Because of a limited number of school buses, drivers and time, school days must remain staggered in some way, according to the school district. "We still believe that Anchorage middle and senior high school students need a later start time and that it will effectively result in them getting more sleep, and we think that will have student performance and wellness benefits," Bingham told the Board. The district will recommend one of the two revised scheduling options to the School Board at its May 21 meeting, Bishop said. She expects the Board to vote on the district's recommendation at its June 4 meeting. It could accept the recommendation or reject it, leaving school start times unchanged. The Board could also give the district another direction, Bishop said. When the district last studied school start times, the Board ultimately decided in 2002 to not change school schedules because of a lack of community consensus.